Everyone I talked to really loved Cusco. I expected to love it too. While I still enjoyed myself there, I can’t say that I would want to spend a significant amount of time there. Three days was good, and four would have been better, but longer than that seems unnecessary to me. However, I met people who came for a few days and then stayed for a few weeks instead. Eh, you can do what you like. I guess I will always compare colonial towns to San Cristobal de las Casas in Mexico because I LOVE that place. So far I have always been slightly disappointed. Maybe part of the problem is that I flew into Cusco and I immediately felt many of the symptoms for altitude sickness, or Sorocha, as they like to say in Peru. I had a horrible headache, I was exhausted, and then I felt like if I didn’t sleep I would vomit. So I spent most of my first day there drinking coca tea and sleeping as much as possible. Thankfully I had arrived at 8 AM so I felt slightly better and was able to get out that afternoon for a bit. Then I realized that I had done something stupid: I had packed the WRONG camera charger!! I brought my beautiful new DSLR and my old point and shoot camera charger. Of course I realized this two days before I was supposed to go to Machu Picchu! So I spent the next two hours finding an electronics area and finally a market called Paraiso (it wasn’t paradise) and found a charger for my T4i. Thankfully I had an extra after-market battery, because I am pretty sure it is a knockoff product that just happens to work for my camera. I wasted $35 on that charger, but it did the trick. I also learned a valuable lesson: double check your camera bag before you go! Also, because it was rainy season it rained pretty hard everyday. 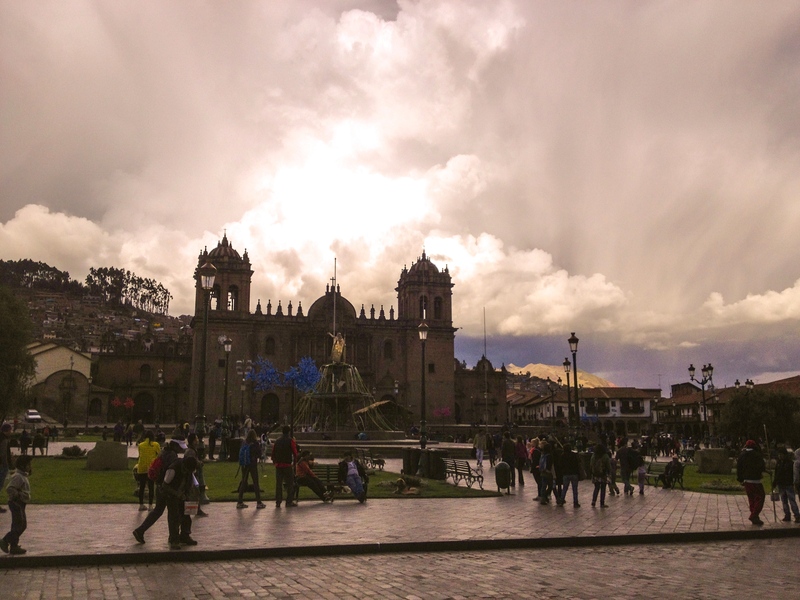 I was able to buy a cheap rain poncho from one of the poncho vendors that pop up with the rain, but I imagine Cusco would be lovely without the rain clouds and thunderstorms. One thing I really loved about my stay in Cusco was the hostel! 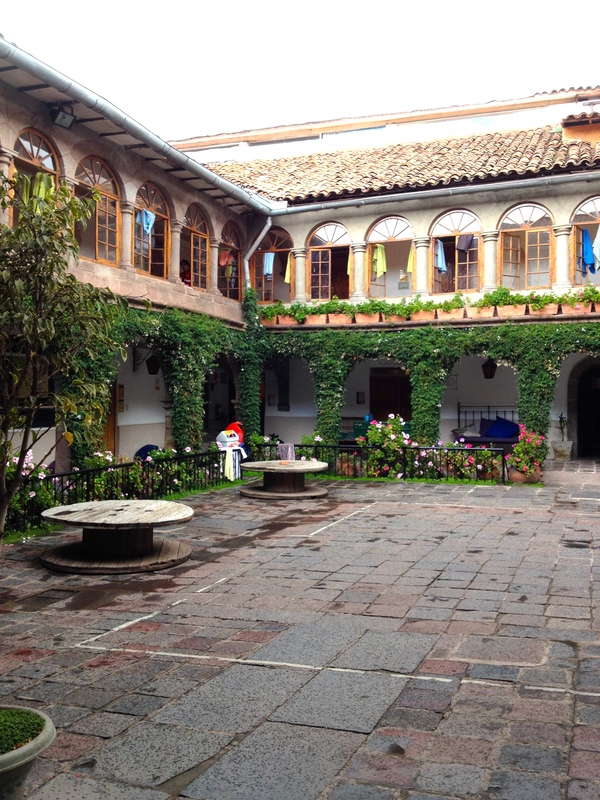 The Pariwana Cusco hostel was beautiful! It has a large courtyard full of beanbags for lounging around and reading a book, a ping pong table, a travel agency, bottomless supply of coca tea and hot water, a small kitchen, an amazing TV room full of floor pillows (that I used as a reading room while waiting for a flight on my last day), a computer room, and a decent restaurant with free breakfast. Of course, they also had the chargers in the dorm lockers and dorms with attached bathrooms as well as central bathrooms so I never had to wait. I was trying to save money on this leg of my trip and there was a grocery store right next door so I just made some simple meals at the hostel. I’ve heard that Cusco is another place that you should try cuy. I went to a couple of museums, but the best one didn’t seem very museum like to me. The best one I went to was the Chocolate Museum! There were maps, demonstrations, and a chocolate tea tasting (really loved the tea!). They also have a cafe on site if you need a bigger chocolate hit than you got from the tea. If you have the time you can also take a chocolate making class! Cusco IS a great jump off place to visit the Sacred Valley and some nearby ruins like Sacsayhuaman. Then of course, I think it is mandatory to go to Cusco before Aguas Calientes/Machu Picchu. It is also really common for people to leave their big backpacks at their hostel in Cusco and just take a daypack up to Machu Picchu (since you are not allowed to bring large bags to MP). This is Part 2 of my Peru and Bolivia series. Please check out Lovely Lima if you want to see part 1. What do you think? 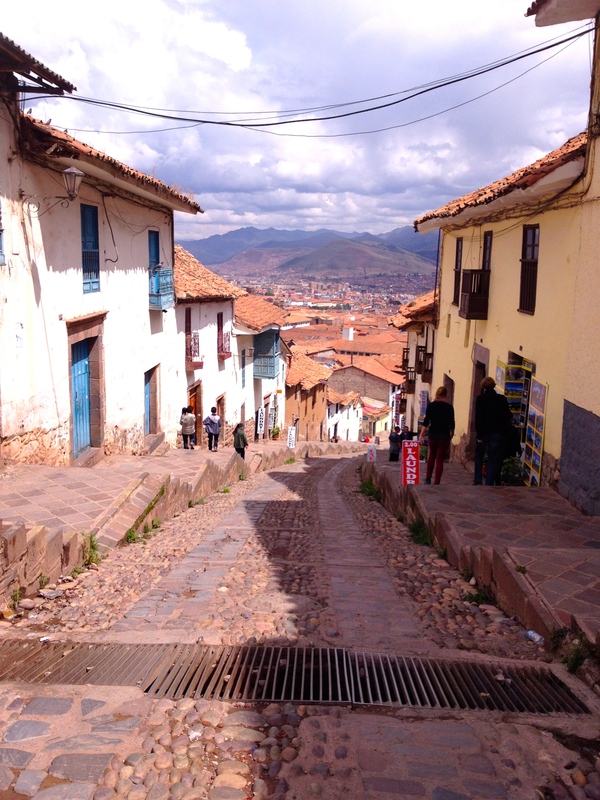 Were you as in love with Cusco as everyone else? Should I make another trip to Cusco and hope for a more positive experience? I missed out on the $6 massages, good reason to go back I guess! Where are the $6 massages?? I’m heading there this summer and would love to take advantage of that, especially after the Lares Trek/Machu Picchu! If you are hanging out by the central square (or even walking quickly through it, women will stop you and offer cheap massages. I never took anyone up on that, though. Have fun! Hi there. There are lots of them in the main plaza. Hot stones cost a bit extra. Just go for a walk around and it won’t be long before someone gives you a flyer! That’s great! I will have to give Cusco another shot one day. Smart! Maybe one day I will get a teaching job in Lima and be able to take buses all over Peru during my vacation time!